Below is the list of Churches who have members that have served in CORE Ministries. If you have people in your fellowship who would like to serve in CORE please contact us! Below you will find links to various different Christian Websites with valuable resources for those with questions as well as believers at all stages of their walk with Christ. Blue Letter Bible - Awesome website with an abundance of Bibles and study resources FREE! Bible Study Tools - This is another good site with a different layout but several good Bible translations and study resources. Living Waters - This is the website where Ray Comfort and Kirk Cameron of "Way of the Master" present numerous resources and awesome links for those looking to know and grow in Christ. Desiring God - This is the main ministry of John Piper. His website is so packed with awesome resources for those people longing to grow in the grace of Jesus Christ! He offers many of his books FREE in .pdf format for anybody with Adobe Reader. You can also hear and watch many conferences and sermons free as well. I highly reccomend his ministry. Answers in Genesis - An apologetics ministry proclaiming and defending the authority of the Bible in General and Bible based, scientific, Young Earth Creation, specifically. ICR - The Institute for Creation Research is another well founded Young Earth, Biblically sound, creation ministry. They have many good resources for creationists and even offer college training. Josh.org - This is the homepage for the minsitry of onetime God doubter and now world famous Bible apologist, Josh McDowell. Josh set out to prove the Bible a fraud and the research left him without a doubt as to its inspiration from God! Gospel Tract Planet(Formerly Custom Tract Source)This site offers many unique gospel tracts. You can even design and order your own custom tracts(Hence the name!). Enjoy their resources. Pilgrim Publications - This site has the comeplete unabridged works or Spurgeon info and resources. If you love Spurgeon check these guys out! Wretched - Todd Friel Hosts both the 2 hour radio show and the half hour TV program. Todd explores evangelical trends and shines the light of God's Word on much of what goes on in "The Church". The show is both sobering and fun! Really, I mean fun! There are many good resources for deeper Bible study and growth in faith. Wretched Club Members receive access to special podcasts. The entire TV show library as well. Wretched Club Members also get a 10% discount at the store and at events! Now you can even be a Wretcheder Member and get 15% discounts with other goodies! Click below! You will find many Bible Study resources here. Dr. James White heads up tis excellent apologetics and Bible teaching ministry. There are many articles dealing directly with Catholicism, Mormonism, JW's, and Islam. This is another great site that takes part in both evangelizing and equipping the saints for the work. They have some great tracts at great prices! Some tracts include popular money tracts they have some other great evangelism resources. KGRV Christian radio has been serving Douglas County and southern Oregon for years with godly Christian radio services. They have a varierty of shows and music to uplift your spirit and strengthen your walk with Christ. Check out their webpage or listen in on am700. 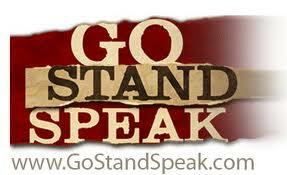 Go Stand Speak is a ministry focussed on getting the gospel of Christ to America and the world. Their major push is through Open Air Preaching. They have an international preacher map where you can find an Open Air Preacher or ministry near you. Cross Encounters is the new Ministry of awesome and powerful Open Air Evangelist Tony Miano. Tony is a retired 20year L.A. County Sheriff deputy. He also worked for Living Waters for some years and now God is taking him out to begin his own ministry that includes this new awesome radio program. Tony will even come to your city and train young men to be effective biblical evangelists! Check his ministry out! Prayer Stop is the evangelism ministry of Dale Rundus and his team. Dale is a soft spoken and godly man who desires to see God glorified and people saved! Ever thought of opening a Prayer Booth with heart towards evangelism but just don't know how? You've come to the right place! See the Movie that has over 2,000,000 hits and is impacting lives today for unborn and already born people alike! How does abortion and Hitler's holocaust relate? See here! Sports Fan Outreach International is an awesome ministry headed up by Bill Adams. SFOI hosts the popular and powerful Superbowl Outreach as well as other sports oriented outreach events. A passion for God's glory coupled with a passion to call lost sinners to repentance makes SFOI an awesome ministry to support and take part in! This is the Facebook page of Max Beebout. He is the owner and creator of Faith Based Design in the Roseburg Oregon area. Max has done the cover art for two of CORE's custom tracts. Check him out for your ministry graphic design needs! Kelly's Kolor Kreations has been a real blessing in making posters for CORE outreach parades. Kelly is a talented artist who has been active in painting and other art for years. Especially kids face painting! If you need some artistic work contact Kelly! Roseburg Rescue Mission has been serving Christ by serving the least of us in this community for decades. I've been blessed to be a Chapel Provide there for roughly a decade. The Mission supports CORE Minstries in our desire to reach out to the lost of any socio economic status. RRM has even let us set up outreach materials on their property. Check out what God is doing there. CARM is short for Christian Apologetics & Research Ministry. This is an absolute must have website for apologetics and Bible study. Also great resources on biblical preaching, including Street Preaching! "Absolute Apologetics at ProofThatGod Exists.org" Is the ministry of modern Presuppositional Apologist and Evangelist, Sye Ten Bruggencate. Sye is an awesome guy with a passion for God's glory and for souls to be saved. I highly recommend his ministry to help you in your apologetics and evangelism!